Peter Connolly, writing from Fort Smith, Arkansas to his father Thomas Connolly in Carrickmacross, County Monaghan. …I got such a shock by the news contained in your letters that it weighs heavy on my mind ‘till this minute. It would not be so much so if I had been able to send help to my suffering friends and to a moral certainty it would have been on the road before now only for a loss I sustained about the middle of April last, which was $100 worth of wood which I had on the bank of the Arkansas river to sell to the steam boats but unfortunately the river overflowed its banks in April and took from me the labor of six months at least. My most sanguine hopes of making a little money and assisting my distressed parents and brothers being thus cruelly frustrated I got on a steamboat as soon as I could with my family and left the place where I experienced so much mortification. I saved as much of the wood as paid for my passage up the river to Fort Smith and I am now living in an Irishman’s house. He has no family and is well off as to living. He makes us welcome to make it our home ‘till we make a home for ourselves which I hope in God will be in the latter end of next fall. 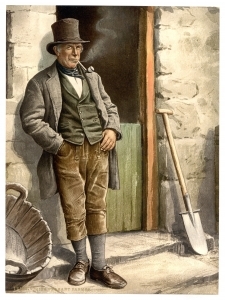 I can get 3 shillings a day British currency for my labor, without diet and everything I need to live on is so cheap that it costs but very little to support a man and his family here. I address myself to my friends. I would say to them come here one and all and don’t hesitate one moment about coming, but how mortifying is the idea that my friends must be debarred from the privileges of such a country as this merely for the want of funds. 50 shillings a head being the fare to New Orleans. Is it, or can it be possible, that the times are so bad that this sum cannot be realized by any person that wanted to come to America? But I believe that there are a great many people in Ireland so trifling as not to come here even if they could. What does this letter tell you about Peter Connolly’s new life in Arkansas? He writes that he experienced “mortification”, which is a feeling of shame or embarrassment. Why do you think he felt that way? How might his identity as an immigrant and a newcomer have contributed to that feeling? Based on this letter, what are some things that Peter is trying to convey? How do you think newcomers settle into unfamiliar communities where they don’t know people? What skills and knowledge do newcomers develop as they navigate their new homelands?